I love reading fiction and non-fiction books. Unfortunately I do not have as much time to read as I would like and I end up reading a lot more while on vacation. I recently took some time off and went on vacation. You may have noticed that I have been posting less often to the blog the past few weeks but now I am back. I feel renewed, with more energy and new ideas to keep contributing! When I was preparing for my trip, one thing I thought about was which books to pack and take with me. After thinking it over, I decided to pack one pocket book and of course, the iPad. Today I am going to be discussing the iBooks App and how to use some of its most relevant features. Before we begin, make sure your iPad is connected to the Internet. If you like this post, you may also like PDF files on iBooks, How to update iPad Apps and Kindle App How to. If you don’t have iBooks on your iPad, it’s time to get it. It’s free. Need a refresher on how to download and install iPad apps ? The current version of iBooks is “iBooks 3” which supports multimedia books with interactive features, diagrams, photos, videos, etc. 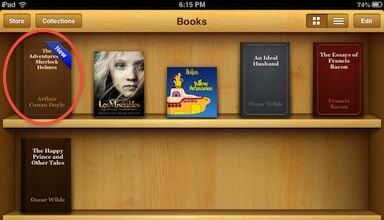 To start iBooks, tap on its icon. iBooks starts and displays a bookshelf with a collection of books or empty if this is the first time you are using the App. The App looks very nice but unless you download some books, not very useful, right ? So lets get started by downloading one. Tap on the “Store” button on the upper left corner. The iBooks Store starts and you can see plenty of books which can be filtered by Category, Top Charts (reviews), Top Authors, etc. On the top right corner (Search Store), type the name of the book you are looking for. 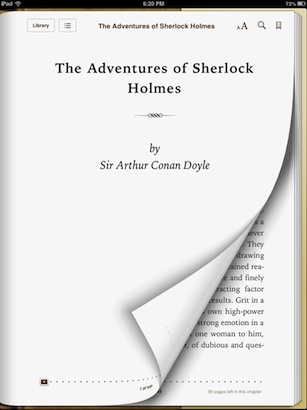 In this example, we will search for “The Adventures of Sherlock Holmes”. Note: Depending on your location some books may not be available to you. When you find the book that you are looking for, tap on the “Free” button next to it. Once you tap on “Free”, the button changes to “Get Book”. Tap on “Get Book” and the book will begin downloading. 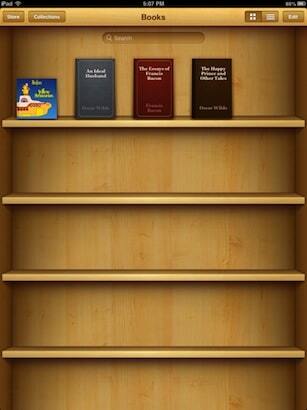 When finished downloading, the book cover will get displayed on the bookshelf. The book opens on iBooks and you can begin reading. To turn a book page, just swipe your finger on the corner of the page from right to left. Similar to what you do when reading a real physical book. Tap once on the middle of the page you are currently on. This will display a menu on top and a slider or page navigator on the bottom of the page. 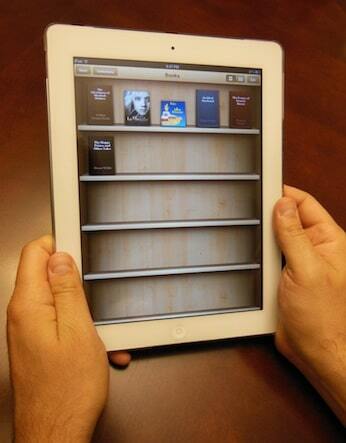 Tapping on library will take you back to the bookshelf where you can see your book collection and open any of them. 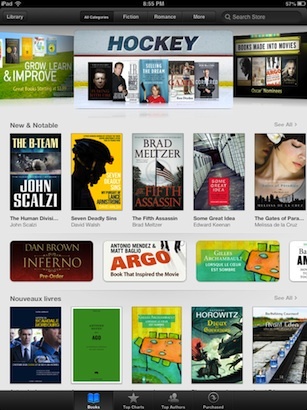 iBooks will remember the page you are currently on and will open the book on that page when you come back. This is the first button to the right of Library. Tapping on this button will display the table of contents which lets you navigate to any page on the index, view Bookmarks and Notes. Tap on the “Resume” button to go back to the page you came from. This menu allows you to set the brightness of the book, change font size and select from a set of seven different font types. You can also change the settings for the “Themes”. 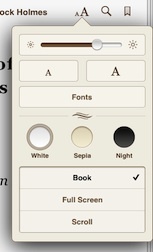 Themes lets you select the background for your book page from White, Sepia to Night. Night is especially useful when your wife or husband is trying to fall asleep and you want to continue reading without disturbing her/him. Give it a try. You will see what I mean. Themes also lets you change between Book, Full Screen and Scroll settings. Book will display your book as a… yes, as a book. Full Screen will display the page in full screen and Scroll will let you scroll down the book as if you were reading a web page on your web browser. Search lets you search for a word or phrase in the book or go to a certain page number. Bookmarks allows you to bookmark one or more pages on the book so you can come back to it later. This slider on the bottom, lets you navigate fast through the whole book. At the beginning of the post I mentioned that iBooks 3 supports multimedia books. If you want an example of how a nice multimedia book looks like, try downloading the free book “Les Misérables: The Musical Phenomenon”. Did you like this post? Your comments are welcomed. Please consider recommending this article to your family and friends by Email, Twitter or Facebook.